I do not spend my spare time playing golf. However I have found a golf course that has great diving too! This dive site just south of the city of Gushikami and above the tourist attractions of Himeyuri Park and the Gyokosendo Caves so there are some familiar signs pointing the way. What to expect: Sandy beach for at least 2,500 meters. A large lagoon with three man-made pools all protected from the open sea that are great for snorkelers. There is even a man-made platform where kids and non-divers can gather and play (during the summer months of May-October). Kayakers can put in over the reef since you can scoot out over the reef very easily. 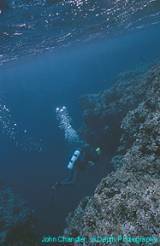 The diving will present you with majestic underwater scenery completely different from what you experience on the China Sea Coast of Okinawa. The Pacific side has large sea mounds coming up from a white sandy bottom. This type of underwater geography is inviting to the big rays that love to hunt in the sandy bottom and turtles. The large sea mounds are carpeted with soft corals and it has thousands of little cracks and crannies to explore. Very similar to Hedo Point in many respects. Depths vary from 15 to 115 feet but the average exploring depth is near 60 feet on the mounds. You can get deeper if just simply have to, but the beauty is between 80 and 45 feet. Aquatic animals found here: Large fish of every kind. Eagle Rays. Sea Turtles have been observed gliding across the coral mounds at 60'. Not many Sea Snakes here. Lobsters are usually seen peaking out of the ledges inside many of the caverns. Best time of year to dive: NOW. Please remember to check out even more ideas for great diving on my web site at www.jwchandler.com and before you go diving check out the weather at www.h2okinawa.com. Here you will find up to the minute prognostications on the weather that will guide your diving. THIS IS A GREAT ADDITION to diver safety on Okinawa. Staying warm for winter diving: Start the day off warm. The wind is your enemy so layer warm clothes under the wind-breaker Buy a comfortable hood or a dive beanie to keep you warm and the hair out of your face (not my problem.) Take a large beach towel so you can dry off right away. Use your wind-breaker between dives and keep a hat on. Be careful with your coffee consumption though because it can be tough on the wet suit later on. 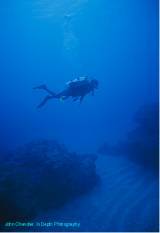 The water is warmer than the air so you will look forward to your second dive. Have fun in the winter because you do not have the heat of summer forcing you toward to the water. Site Location: Take the expressway south toward Naha. Veer left on the expressway just past the Nishihara exit and take the exit toward Haebaru-Kita. Pay toll (¥350 from Nakagusuku) and travel across the new elevated highway until it forces you to turn left and then onto what will become Highway 507. Stay on 507 and it will move you back off the highway again and bear you right to a stop light. Here turn left and follow the sign and directions pointing toward Kochinda and Gushikami. You are now on a straight shot to Gushikami. You will also be comfortable following the frequent signs to Himeyuri Park as well. Follow 507 through the hills and cane fields of the Itoman Peninsula. Drive through Kochinda Town, bear left at the stop light and then straight onto the three way intersection at Gushikami where Highway 507 meets 329. A large pedestrian overpass marks this spot and turn right on Highway 329. Move through Gushikami heading south toward Peace Prayer Park. About 150-200 yards past this intersection, and on your immediate left, is a large red arrow beneath Japanese writing pointing you left. In very small English writing you will also find "Southern Links" written above this sign. Turn left here, up the hill into a well paved, street and bear left in front of a nice hotel. Turn right on the paved path at the end of the hotel that winds down and around the golf course. Follow this down the hill. You are at Southern Links. Park where you will off-season, even as far as the sand. During summer there is a nice parking area near the hotel's beach house. Common courtesy is expected from everyone so please be sure you take any refuse you brought with you when you leave.